An historic pilgrimage in the footsteps of Léonie Martin and of her father, Blessed Louis Martin, took place in France today. 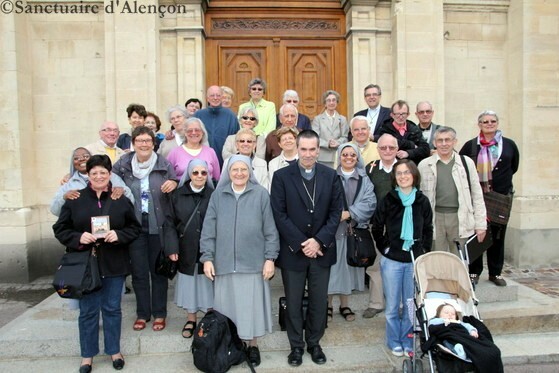 The volunteers of the newly organized shrine at Alencon, who welcome pilgrims who want to walk in the footsteps of the Martin family in and near Alencon, in the diocese of Séez, where Louis and Zélie Martin met, married, and spent their married life, and where Thérèse was born, made a pilgrimage as a group to Caen to visit the Monastery of the Visitation, where Léonie Martin lived from 1899 until her death in 1941, and the Bon Sauveur Hospital, where Blessed Louis Martin was confined from February 12, 1889 through May 10, 1892. Mgr Habert, bishop of SeezThey were accompanied by Mgr Jacques Habert, bishop of the diocese of Seéz. Father Thierry Hénault-Morel in the Visitation chapelFather Thierry Hénault-Morel, the rector of the basilica of Notre-Dame at Alençon, was their guide. The Shrine at Alençon has already posted 94 photos of the pilgrimage. Although the captions are still in French, it is a wonderful chance to see photos of the Visitation chapel and the crypt, Léonie's souvenirs and her tomb, and almost the first contemporary photos of the interior of the chapel at the Bon Sauveur where Louis Martin worshipped. [Update in 2019: I regret that the Shrine appears to have removed these photos from its Web site].